Fire! is based on the classic "cannon" game genre. I can't remember any names, but I do remember wasting many hours of my childhood on a version that involved gorillas launching bananas at each other. I wanted a new CS project, and this seemed like a viable and interesting challenge. 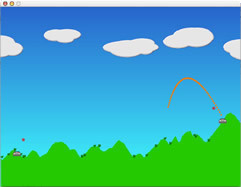 Two players place their bases at either end of a 2D terrain. Players take turns firing a deadly projectile from their base. They can adjust the angle and power of the shot. 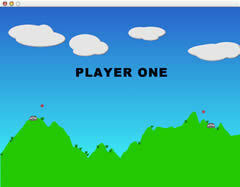 The terrain is randomly generated at the start of the game. Bushes are randomly distributed on the terrain surface. 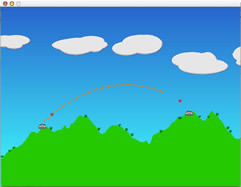 Projectiles explode on contact with the ground and deform the terrain. 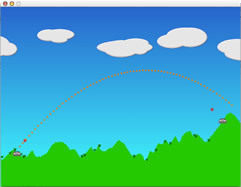 Wind affects projectiles in flight. Clouds drift to show players wind speed and direction.